They are both clear and vibrant. Although on the underside there is slight crazing, as shown in the photographs, which is to be expected with the age of these lovely pieces of pottery. A chance to own truly charming and interesting side plates. Very good condition,no utensil marks. 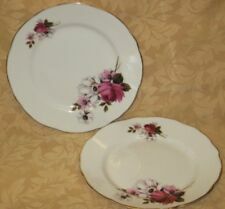 & have the usual Royal Stafford Bone China Made in England backstamp on the bottom. They are both in Lovely, Clean used condition and. U.K. - £2.95. See photos as part of condition report. You can do this for any reason including having changed your mind. In the last photo is the one in the worst condition. This will always be honest, however condition can be a matter of opinion and honest mistakes can be made. 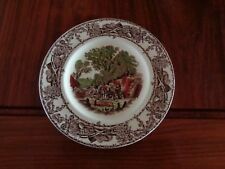 & have the usual Royal Stafford Bone China Made in England backstamp on the bottom. They are all in Lovely, Clean used condition and. Good First Quality Circa. Australasia / Worldwide £6.00/£3.00. Fine bone china side plate in "Bird of Paradise" pattern with ribbed edge and bright gilding to the rim, manufactured by Royal Stafford China of Longton, Staffordshire, England. Appears as-new. Lorraine's Emporium. Replacement fine bone china side plate in "Romana" pattern with bright gilding to the edges, manufactured by Royal Stafford China of Longton, Staffordshire, England 16.5 cm (6 1/2 inches) diameter.